57 Comments on "Bermuda Triangle: Ship Reappears 90 Years After Going Missing"
Someone contact Dirk Pitt at NUMA! Quick! Find AL and the Admiral! Love Dirk and Al and Clive. I thought it was the Cyclops from Cussler’s book of the same name! Maybe Dirk Jr. and Summer could help out. Best comment of them all!!! as to sattellite imagery or some other modern technology seeng this ship, very unlikely. It wouldn’t be being looked for having been lost 90 years ago. Tankers are being hijacked in Asia and lost long enough to have their cargo pumped off……. They will probably find out it has been aground many times. There are many sandy beaches without rocky shores in that area. I think it is plausable its been drifting around especially without the cargo. I like some variaion on the Pirate theory. I wonder what was going on politically post WW1 and way before WW2? It had a skeleton crew. @ Ted Fink, yes and where is the cargo, is it still on board? How can a ship this size be beached without being seen on someones radar, or a sattellite should have seen it floating or even beached. When will we hear about this in the news? That is the exact question I just asked. Lol. Someone said it was a skeleton crew. Lol. This is a very interesting matter. Would the authorities, searching and identifying the mystery disclose and publicize their findings with detailed report thereof ? I would like to understand the details of this incidence. Is the cargo still on the ship? thats what we all want to know? Exactly. If it’s missing, then this was a human-involved disappearance. Pirates, or the crew stole & ran. the cargo was coal, enviro wackos stole it. It could have been beached or caught on a sand bar somewhere. No telling. But dead men tell no tales. As for rain. The ship should have been water tight. Rain should have not been a bad issue. But the rust could have been. Salt water an rough seas. It’s a strange situation for sure. probably washed ashore somewhere on dry land until a storm washed it back out. What type of fuel was this steamer powered by? Coal? That may be the answer as to where the cargo went. Yeah. This is totally weird. Ship disappear on 90 years. But the crew on ship? No idea what happen to them! N0 proof that may solve this mystery for decades. Some scientists claim to have discovered the river that flows within the sea, disorder tectonic plate that sea currents encased in a channel width of several kilometers and turned into a sea river that pulls ships, electromagnetic distortion that destroys planes. Others have an explanation that this higher intelligence that manages in our time and space, parallel dimensions and so on. The question is whether we will get to the bottom and when? That was the first thing I thought when I read the article. 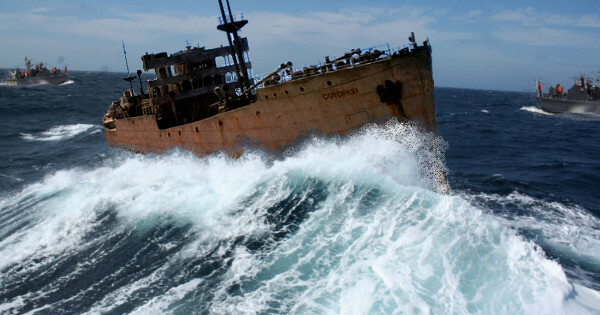 my question is, does a ship can survive for a 90years in the ocean w/ no crew on board?! not in my opinion ,as a elder shr would have rusted out her hull at the waterline and sank long ago,and the ingress of water from rain over 90 years would have filled her up ,,i would like to know where her cargo of coal is ,,is it still on board? This has Philadelphia Experiment written all over it. I know it was ‘after’ this ship’s disappearance, but it’s all about time travel, isn’t it? My question is “Where is the cargo” . If the cargo is missing, blame pirates. With our re-established relations with CUBA, there are probably lots of secrets they have with-held. Just a suspicion….. I could have been beached for all that time and released to sea by a storm. Anything is possible because time mightn’t be a factor. i bet it was beached on a no nothing island, and finally the island was over taken by water and the ship re launched. extremely crazy for sure. Parallel universe. On the other side there may be no water there, allowing the ship to survive for so long, the cargo would have been taken off, the crew, long gone…then it got sent back through some how and now it’s in our ocean again. My simple opinion. Yes a ship can, that ship would survive at least 150 years alone before sinking. a wooden ship will last at least 75-90 years before sinking. If this boat was “beached” somewhere for 90 years until the tide released it, would it not have been spotted by overhead satellites, planes, humans…it could NOT have been sitting exposed, or it would have been seen regardless of where it was! My opinion only! Brilliant. We “normalize” relations with Cuba and suddenly a US ship surfaces 90 years later. Who wants to bet that the disappearance of this ship and other craft have more to do with Cuba than the Bermuda Triangle. Murdered crew and captain, stole cargo. Ship would not last if left on ocean water 90 years. Had to of been dry docked. Seriously. Are you yanks that paranoid? You don’t think your government may be culpable. Ange, aren’t you a bit paranoid about the Yank’s government? Then again, it could have been on Hillery’s server. Portals open and close with time missing, so its likely that the ship has not necessarily been in water for 90 years in it’s time, only to us it appears 90 years later, but may only have been a few years in total to the ship/crew. You state this as a fact. Do you have any evidence to demonstrate these portals? The Triangle is a demensional portal. Many ships have come back over the years like that. Look at the movie Ghost Ship! The documentary on the special features says that ship is one of them as well. Read people.